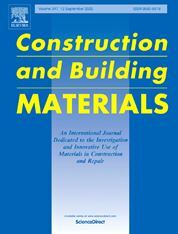 An international journal dedicated to the investigation and innovative use of materials in construction and repair. Construction and Building Materials provides an international forum for the dissemination of innovative and original research and development in the field of construction and building materials and their application in new works and repair practice. The journal publishes a wide range of innovative research and application papers which describe laboratory and to a limited extent numerical investigations or report on full scale projects. Multi-part papers are discouraged. Construction and Building Materials also publishes detailed case studies and some incisive review articles that contribute new understandings. We are focusing on construction materials papers and we exclude papers on structural engineering, geotechnics and unbound highway layers. The construction materials and technology covered include: cement, concrete reinforcement, bricks and mortars, additives, corrosion technology, ceramics, timber, steel, polymers, glass fibres, recycled materials, bamboo, rammed earth, non-conventional building materials, bituminous materials and railway material applications. The scope of Construction and Building Materials includes, but is not restricted to, materials, NDT and monitoring aspects of new works and repair and maintenance of the following: bridges, high-rise buildings, dams, civil engineering structures, silos, highway pavements, tunnels, water containment structures, sewers, roofing, housing, coastal defences and railways. At a time when the pressure is on all engineers, architects and contractors to optimise use of new materials and up-to-date technologies, Construction and Building Materials provides essential information that will help improve efficiency, productivity and competitiveness in world markets. It is therefore vital reading for all professionals and academics involved with research into, or specification of, building materials. Author duties: Acceptance of a manuscript for publication in the journal carries with it an understanding that the author, when requested, will fulfil an obligation to contribute their expertise to the review of others' manuscripts. Authors are also requested to name five independent referees together with institutional email addresses. The named possible referees must not be from their own institution.